The two graphs below give an inclination of which teams have played young Méxicans the most this season. The first graph shows per team the number of Méxicans under-23, at the time of writing, that have played in the Apertura and Clausura, whilst the second graph displays the number of minutes that U-23 Méxicans have received this season. Note that naturalizados aren’t included in this data and neither are dual nationals who have been playing for other nation’s youth teams. 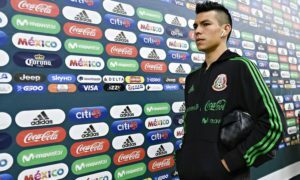 Sebastián Saucedo from Veracruz is included has he’s turned out for the youth teams of both the USA and México. Unsurprisingly, Chivas and Pachuca top this chart, having used 9 and 8 Méxican U-23s respectively. At the other end, Morelia and Veracruz have only fielded 2 different young Méxicans. The majority of sides, 11 out of 18, sit between the 5 and 7 player mark. But whilst this data is useful, it doesn’t display how much football the youngsters have received. 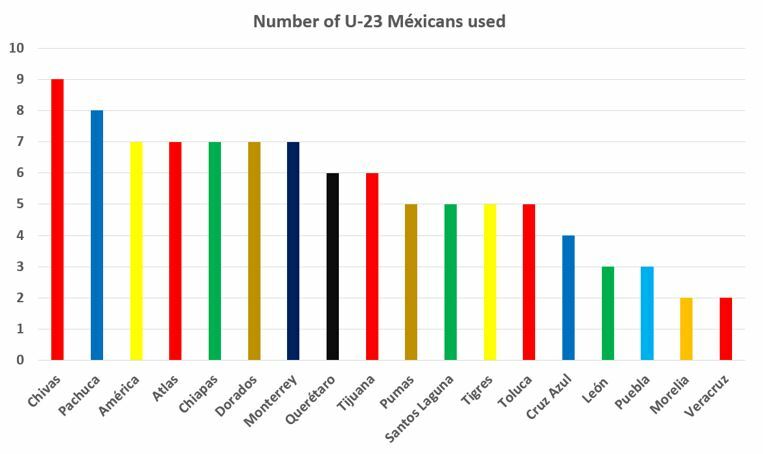 The second graph, looking at total minutes given to U-23 Méxicans, is potentially a better guide to finding out which Liga MX teams give the most opportunities to youth. Chivas also top the minutes chart, with Pachuca close behind. All other 16 clubs lag far behind. When looking at total minutes played rather than number of players used, Chivas and Pachuca are once again ranked 1st and 2nd, but the gap between them and 3rd placed Atlas, more than double the amount of minutes, is remarkable. Whilst Chivas and Pachuca have given over 8000 minutes each, 6 teams have given less than 1000 Liga MX minutes to U-23 Méxicans this season, with Puebla ranked last on this chart. It’s also interesting to note how teams differ between the two graphs. 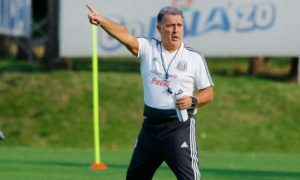 For example, whilst Morelia have only given 2 Méxican U-23s, Erick Aguirre and Armando Zamorano, minutes in both the Apertura and Clausura, those minutes add up to over 2000. Meanwhile, América’s 7 Méxican U-23s have received less than 500 minutes cumulatively. There are obviously some issues with this data; it only includes this season, and you may disagree with the decision to look at U-23s. It also doesn’t take into account whether the U-23s have been bought from other clubs or if they are youth academy products. But I think the graphs are interesting to look at and analyse. So what do you think about the data? Is it what you expected, or is there something which surprises you? 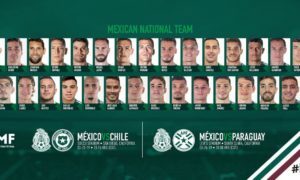 Does your team give Méxican youth enough first-team football? 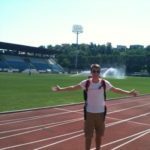 Let me know your thoughts on twitter, you can find me @tomh_36.